On a previous trip, I had explored the furthest practical day trip to the north of my Pacific Beach house. That brought you after exactly 100 miles to the parking lot of the Hoh Rain Forest. So, on this trip, I wanted to see how far you could get to the south in a day. I found that a drive of 105 miles would bring me to the base of the Long Beach peninsula at Seaview. That puts about 2/3rds of the Washington Pacific coast within reach of my house. And what a pretty drive this was. You follow highway 101 to the south from Aberdeen, across the Chehalis River, past Cosmopolis, and up into a terrain of rolling hills. Up the first big hill you climb is a tremendous view back down the Chehalis Valley. If the day had been more clear, I think you could have seen the Olympics and Mount Rainier from this viewpoint. Next, you pass through an area of forested rolling hills and sparse habitation. Considerable logging goes on in these hills. At length, you arrive at the town on Raymond on the Willapa River. Raymond holds some historical interest with two museums and a historic theater. If you need gas or food, this is your last chance for a while. Immediately south of Raymond is South Bend, the county seat of Pacific county. This town has a magnificent courthouse built in 1910 with extensive stained glass. Apparently, Pacific and Grays Harbor counties were competing to build the most opulent courthouse around the same time (see the courthouse in Montesano). At South Bend the road reaches Willapa Bay and follows the eastern shore of the bay for the rest of the drive. Willapa Bay - like Grays Harbor - is mostly filled with mud, so you will either be looking at vast mud fields or a vast expanse of water, and you wouldn't suspect the water is only a couple inches deep. The view here is very pretty with a few islands (a couple inches higher than the mud) in the bay and the forested hills all around you. We arrived at the Long Beach peninsula without a plan. I simply drove to the nearest beach access, which turned out to be the community of Seaview. The beach looks very much like our North Beach: wide endless sands. We asked each other why we had driven so far to trade one beach for another. We learned here that the Long Beach peninsula is better organized than our Grays Harbor county beaches. An asphalt bike/pedestrian connects all the communities, running behind the beach through the beach dune grass. Restrooms, benches, and interpretive signs are provided all along the way. We walked north on the beach from Seaview to Long Beach, and then back along the path. At Long Beach they had the skeleton of a grey whale that had washed up nearby in the year 2000. Unfortunately, they left this skeleton open to the elements, so it is considerably decayed. The museum at Westport demonstrates the better way to display a whale skeleton - outdoors, but covered and behind glass. Again, not having a plan, we had a look at a map of the area that was posted near the parking lot. There were many attractions we didn't have time for, so we decided to concentrate on Cape Disappointment State Park with its two lighthouses. This cape is a small mountain sitting at the base on the peninsula and at the mouth of the great Columbia River. I think I missed the main entrance to the park, and we ended up on a pretty road giving us views of the Columbia. We noticed that the vegetation looked very different from what we were used to up north. We thought it had a vaguely tropical look to it. Lost in the park by this time, I followed a sign to the North Jetty. They have three jetties in this area: at the base of the peninsula where we now found ourselves, and two that bracket the Columbia river mouth. As soon as we parked by the jetty, I realized that we had stumbled across one of the iconic views of Washington state that I had seen before on calendars: the Cape Disappointment Lighthouse standing out on a promontory along a steep, rocky shoreline. This is the picture I show up above at the top of this page. Next, we drove around and found the trail to this Cape Disappointment Lighthouse. The lighthouse is closed, but the views here are tremendous: down on the Columbia and south to Oregon, out to the ocean, and north along that pretty coastline. 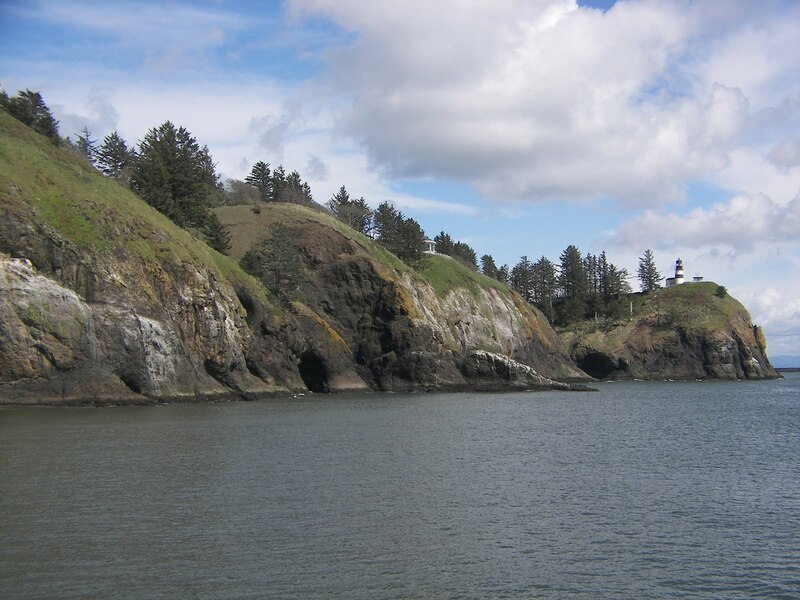 Here you can see the Lewis and Clark interpretive center that also sits on the cliff's edge and must have a great ocean view. We didn't have time for the interpretive center - we saved something for next time. Instead, we hurried along to the North Head lighthouse in another area of the park. This lighthouse is reached by a short, level trail. It passes by two lightkeeper houses that are available for rent as vacation rentals. One had been recently remodeled and the other was under scaffolding. The trail passes through a pretty, windswept forest and then comes out to an open bluff with wide views of the ocean and coastline. Below us to the south were the North Jetty and an undeveloped beach behind it. We met some ladies from Oregon here and they pointed out Tillamook Rock offshore from Tillamook, Oregon. This rock was just barely visible as a tiny pimple on the surface of the ocean. If she was right about this, we were seeing a rock 50 miles away. A little further along we reached the North Head Lighthouse. Again, this lighthouse was closed, but picturesque. The views all around were tremendous of the ocean and rocky coastline to the north. That's all we had time for. We didn't want to drive home in the dark, so we hurried on home and enjoyed the sunset at Pacific Beach.